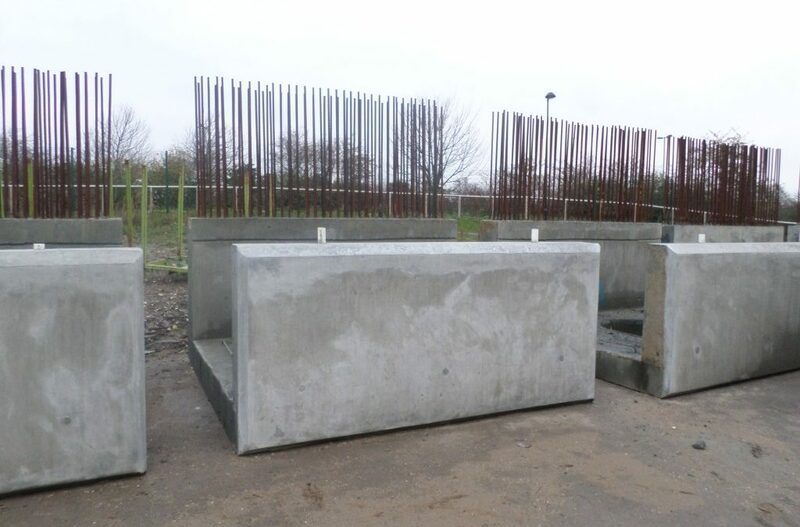 A civil engineering company needed to modify precast concrete panels and employed Hydroblast to carry out the task. Such a task requires efficiency, accuracy, and safety; something that we pride ourselves on providing to all clients. Visually, our instructions for the task can be seen in the below image. The task at hand required the precise cutting of precast concrete, something that is very difficult with more traditional methods. Equipment such as saws and jack hammers can cause cracks and chips in remaining structures, which not only ruins the appearance of concrete, but also weakens the rest of the structure. It is also much harder to cut concrete this way, particularly when needing to do so precisely, which makes it much more time-consuming than our water jetting alternatives. 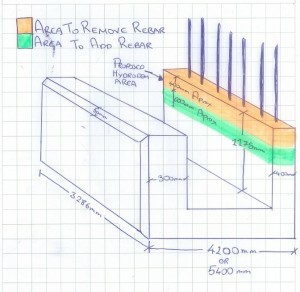 Additionally to these issues, it was important to take note of the rebars inside the precast concrete for this job. 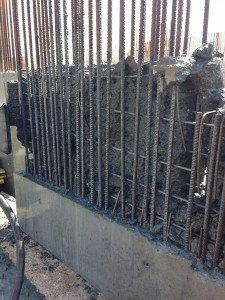 Traditional methods would run the risk of damaging the rebar by inflicting too many vibrations, or the rebar even damaging the equipment if they were to come into direct contact. Using high pressure water jets in cutting reinforced concrete, on the other hand, is much more efficient. 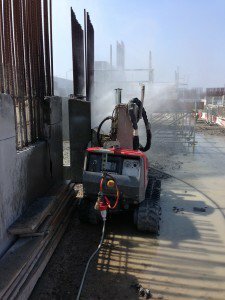 The high pressure water jets are incredibly precise and able to remove every bit of unwanted concrete whilst leaving rebars completely undamaged. Our method of hydrodemolition is also much safer than many other approaches to concrete cutting, with hand-held breakers and other equipment being linked to Hand-Arm Vibration Syndrome (HAVS), which can have serious consequences to nerves in the fingers, hands, and arms, and also blood circulation in these areas. Additionally, standing close to the cutting of concrete also poses as a threat to workers as pieces of concrete can chip and fly off with some techniques. The client recognised the difficulties of cutting concrete of this nature and also the safety risks associated with it, which is why they approached Hydroblast to use a safer and more efficient method. We chose to use our Aqua Cutter 410 Evolution robot due to its precision and ability to be controlled remotely; having this ability makes the method safe for operatives who are able to stand a safe distance away. With our experience, knowledge and equipment, we were able to complete the task in a timely manner and the rebars and remaining structures went unscathed. The client was extremely happy and it was another successful job for us here at Hydroblast. We have built up years of knowledge and experience when it comes to hydrodemolition, as well as being leaders at investing in new technology that makes us able to take on a wide range of specialist tasks. The safety of our team and those on site is a huge priority of ours, along with making sure that the environment is protected in the process. To understand the benefits of hydrodemolition further, we have developed a guide on the benefits of hydrodemolition. Speak to Hydroblast today if you have a project that requires the safety and precision of hydrodemolition from a skilled a knowledgeable team. If you’re unsure how to cut reinforced concrete, it is a particular strength of ours and we will be happy to assist.